Would you like to know what a cat would look like without hair? Then take a look at the Sphynx cat. With a wrinkled looking face, very large ears, big eyes, and an almost hairless appearance, they can look a lot like little aliens. You may have seen one of these unusual cats and not known it. Have you seen that funny looking cat known as Mr. Bigglesworth in the Austin Powers movies? He's a proud member of the Sphynx cat breed. 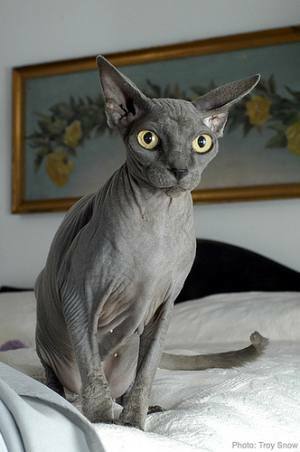 The lack of hair in the Sphynx is a natural mutation. That is to say, the breed was born by accident. It is suspected that the "hairless cat" has appeared naturally throughout the history of domestic cats. As for the modern version of the Sphynx cat breed, it is said to have been developed twice. In 1966, a hairless cat was born in Toronto, Canada. This cat became the founder of the breed, but a limited gene pool cause health issues and the line disappeared. In the 1970s, a second line of cats appeared as hairless, and the breed was revived. This line was originally outcrossed to Devon Rex cats. This apparently produced some health issues and was eventually discouraged. Over time, the gene pool for this breed has been strengthened. For many years, breeders have crossed the Sphynx cat breed with cats of normal coat and therefore have a strong gene pool. The current Sphynx is healthy and the outlook for the breed is good. Although the Sphynx does not have a coat of hair, per se, this breed has a light coat of fuzz to varying degrees. They are said to feel like a warm peach or a suede covered hot water bottle. The Sphynx cat comes in every color and pattern possible, but it's the skin, not fur, that shows off their color. This breed has a powerful and extremely muscular body. They are considered medium sized, being about eight to fifteen pounds. It's easy to say that the most distinctive feature of the Sphynx cat is its extraordinary appearance. But cat lovers the world over are also fascinated by this breed's intelligence, personality, and behavior. These cats are incredibly mischievous and fun loving pets. They have a monkey-like agility and playfulness, and will amuse themselves, and you, for hours. Make sure that you provide your cat with fun toys and be prepared to spend a lot of quality time with her. The Sphynx enjoys spending time with her family, and does not like to be left alone. If you work long hours or otherwise can't devote a lot time to these cats, then this may not be the cat for you. If you do spend a lot of time away from home, consider getting your Sphynx a companion to play with. The Sphynx loves to be with people, but may also enjoy spending time with other cats or even dogs. 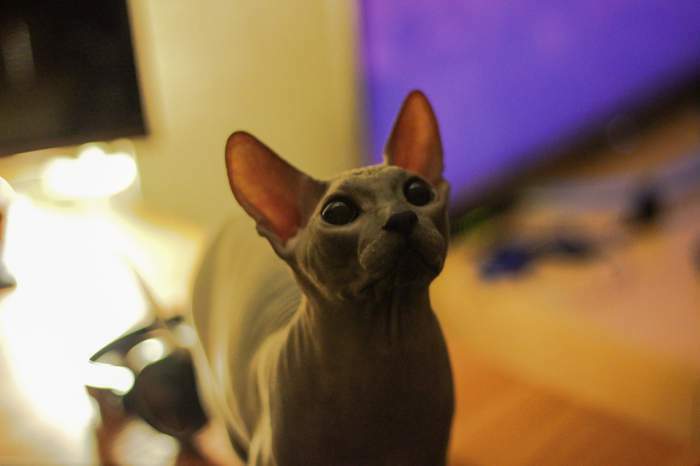 Because of their unique coat situation, some extra care is need to tend to a few possible physical issues with the Sphynx breed. Despite the lack of fur, this hairless cat needs some regular grooming. Could a "hairless" cat need more grooming than one with a full fur coat? Since there is no hair to absorb the natural skin oils, it accumulates and has no place to go. You should wipe your cat down every day with a soft cloth to remove the oil. You'll also need to clean the ears and around the claws, and most Sphynx parents will bathe their kitty regularly. You should get your cat adjusted to being bathed as a kitten. Another concern for Sphynx owners is that the lack of a thick coat of hair leaves these cats vulnerable to cold temperatures. Be sure to provide access to bedding, another cat, a dog, or a person to snuggle up with to help keep your cat warm if needed. There are plenty of styles and types of cat beds, including heated ones. Keep in mind also that anywhere a cat has less hair, there is also the possibility of sunburn and skin cancer. For the Sphynx, that's pretty much all over. Kitty cat sunscreen can help. Do you have a hard time wondering how a cat breed can be both rare, and popular at the same time? The Sphynx is so appealing by nature that even though rare, they are a big hit at cat shows. Since they love people, they often don't mind being handled, which makes them easy to show. In addition, the general public has become much more aware of the Sphynx since the Austin Powers movies as well as other celebrity Sphynxes. One that comes to mind is Dina Manzo's Grandma Wrinkles (Real Housewives of New Jersey). You should note that the Sphynx is sometimes referred to as the Canadian Sphynx. This is to differentiate them from the Russian born Sphynx breeds. In the late 1980s, a hairless cat appeared in Russia, and a separate breed was developed. That breed is now known as the Don Sphynx. Later, that breed was crossed with Oriental cats to form the Peterbald. The Peterbald has the coat of a Sphynx cat, but the grace of the Oriental cats that are part of its heritage. The Sphynx cat has been called by some, the rarest and most unusual cat breed on earth. While there are rarer cats for sure, breeders often have a waiting list. If you're up to the task of taking care of one of these beauties and you are willing to wait... and if you'd like a cat that looks like an alien and acts more like a loveable monkey than a cat, then you'll want to live with a Sphynx.